Also serving communities of Sturtevant. There are 14 Assisted Living Facilities in the Racine area, with 11 in Racine and 3 nearby. The average cost of assisted living in Racine is $3,244 per month. This is lower than the national median of $3,346. To help you with your search, browse the 77 reviews below for assisted living facilities in Racine. On average, consumers rate assisted living in Racine 4.4 out of 5 stars. Better rated regions include Pleasant Prairie with an average rating of 4.9 out of 5 stars. Caring.com has helped 5 families in Racine find high-quality senior care. To speak with one of our Family Advisors about assisted living options and costs in Racine, call (855) 863-8283. Racine, Wisconsin is the fifth-largest city in the state with a population of nearly 78,000. In January 2017, Racine was crowned "the most affordable place to live in the world" by the Demographia International Housing Affordability survey, proving the city to be an economical area where seniors can settle. There are 14 assisted living facilities in the Racine area for residents to choose from. 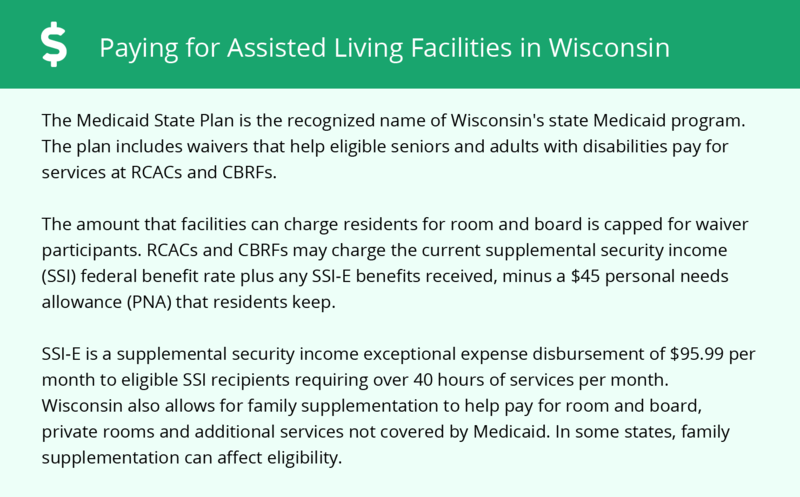 The Wisconsin Department of Health Services licenses and regulates four types of assisted living facilities (ALF) in Racine and across the state. These programs are defined as facilities that supervise individuals with some level of need but who don't need 24-hour nursing care. The four types of ALFs include adult day care, adult family homes, community-based residential facilities and residential care apartment complexes. Mass transit in Racine is provided by the Belle Urban System, known as BUS for short. Seniors receive half-off fare with valid ID. For seniors who like to fly, Racine is one of three Wisconsin cities with a public international airport, Batten International Airport. Racine is home to many museums and galleries. The Racine Art Museum boasts the largest collection of modern artwork in America, with over 4,000 pieces of ceramic, jewelry, glass and wood, and over 4,000 works of paper and sculptures. Seniors receive a 30 percent discount when visiting the Racine Art Museum. The Racine area is home to world-class medical facilities, including Wheaton Franciscan St. Luke's Hospital, in the event of medical emergencies or illness. Racine has an array of community resources for seniors, including the Racine's Senior Adult Activities and Clubs, an organization that provides programs such as a nutrition plan, ballroom dancing and wood carving (and free coffee). Racine experiences 15 more inches of snowfall annually than the national average. With summer highs hardly reaching 80 degrees, Racine's cold weather could be a drawback for seniors choosing to live in the area. The city of Racine has an unusually high crime rate, and seniors' chances of being a victim of violent or property crime are 1 in 29. Assisted Living costs in Racine start around $3,244 per month on average, while the nationwide average cost of assisted living is $4,000 per month, according to the latest figures from Genworth’s Cost of Care Survey. It’s important to note that assisted living rates in Racine and the surrounding suburbs can vary widely based on factors such as location, the level of care needed, apartment size and the types of amenities offered at each community. 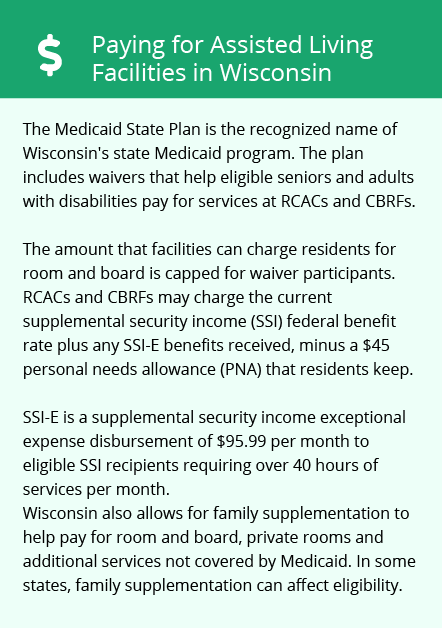 In the state of Wisconsin, the Exceptional Expense Supplement for Members of Supplemental Security Income (SSI) program allows qualifying seniors to receive additional Social Security income that can help pay for assisted living. On a federal level, seniors can receive aid through Medicaid's Medical Assistance Personal Care program when residing in an ALF with less than 20 residents. To see a list of free assisted living resources in Racine, please visit our Assisted Living in Wisconsin page. Racine-area assisted living communities must adhere to the comprehensive set of state laws and regulations that all assisted living communities in Wisconsin are required to follow. Visit our Assisted Living in Wisconsin page for more information about these laws.